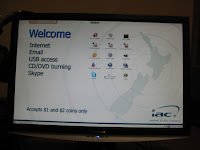 I had the opportunity to attend LCA2010 in Wellington, New Zealand in January of 2010. It was an amazing conference, in an awesome city. You can read all about it here. 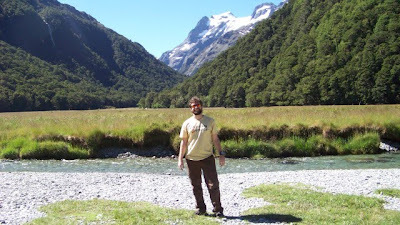 But as soon as the conference was over, I struck out for the southern island to really get to know New Zealand. 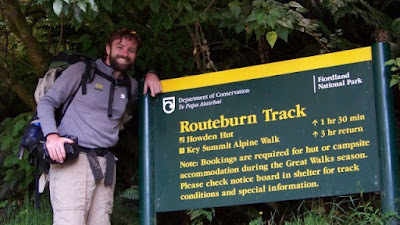 My goal -- the Routeburn Trek -- one of the Five Great Walks of New Zealand, a 33km hike between the Mount Aspiring and Fiordland National Parks. 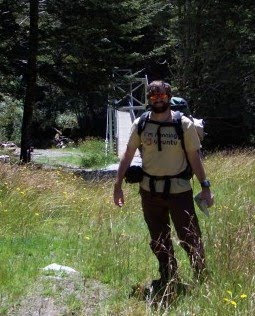 Readers who follow my blog know how much I like a good long walk, having written before about my treks through Scotland, Yosemite, and numerous other hikes I haven't yet written about (Grand Canyon, Big Bend, Interlaken, Cinque Terre, etc). I left Wellington late on Friday evening, flying Air New Zealand to Christchurch. I must say, my experience on 6 flights in 2 weeks on Air New Zealand was very impressive. These guys run an excellent operation. All of my flights were on time, no bags damaged or lost, and I was able to trivially bump my flights to earlier ones on 3 occasions, flying stand-by for no charges or extra fees (errm, Continental -- take some lessons). And their in flight safety video is genius! I couldn't catch the direct Wellington -> Queenstown without missing some of the conference, so I had to stop over for a night in Christchurch. I didn't see any of Christchurch except the Sudima Hotel, but my even was not entirely uneventful. My bus driver noticed my Ubuntu baseball cap and proudly told me that he and his son run Kubuntu. And after checking in at the Sudima, I noticed that their internet Kiosks in the lobby were running Hardy ;-) So I watched an episode of Dexter and called it a night. 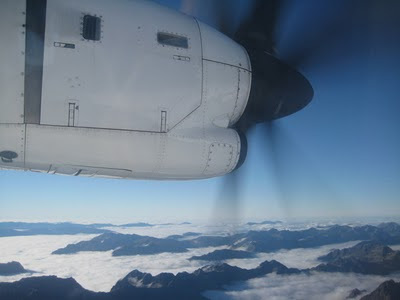 I took the first flight from Christchurch to Queenstown on Saturday morning, on a noisy little propeller aircraft. The flight was beautiful though, cruising just a bit over gorgeously carved mounts and fiords. 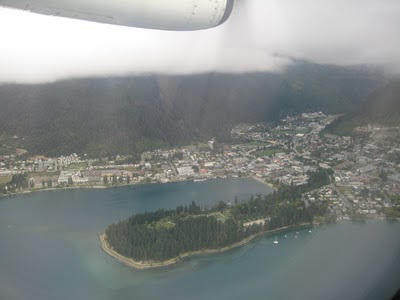 The landing was interesting, as we sort of spiraled down to the little Queenstown runway. 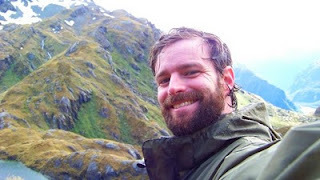 I took the bus to Queenstown's center, where I needed to checkin in person with New Zealand's Department of Conservation (DOC) office and retrieve my hiking and camping permits. 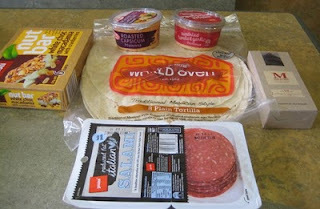 With that done, I needed to pick up a few groceries and provisions. 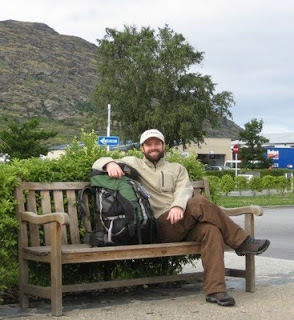 I was traveling pretty minimally, without pots or pans, so I avoided foods I had to cook. 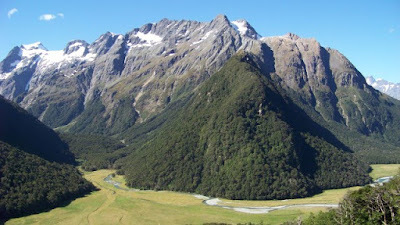 Two containers of hummus, some tortillas, salami, granola bars, chex mix, and a small bottle of New Zealand single malt whiskey (10 year old Milford Sound). Unfortunately, the hypersensitive New Zealand biosecurity terror prevention force seized my Texas Jalapeno beef jerky when I passed through customs. Damn. 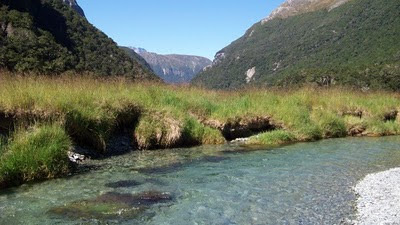 So then I hooked up with my transportation to the start of the Routeburn Trek, some 70km away from Queenstown. 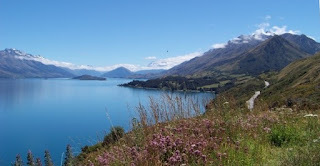 The drive was absolutely picturesque, driving along Lake Wakatipu for several hours. And another half hour later, I was at the start of the Routeburn Trek for a bit of relaxation in the form of hiking twenty-something miles. 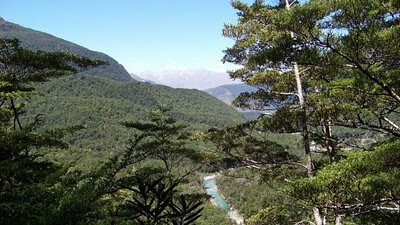 Now the end of the trek is a good 250km from Queenstown. Yeah, strange. But that's how it goes in the mountains. Day 1 was almost entirely uphill. I prefer to start hikes like this (as oppose to hiking into canyons), as it's nice to do the uphill work on fresh legs, feet, and back. The weather was gorgeous on Saturday, sunny and clear. As the Kiwis say, the weather was 'fine'. 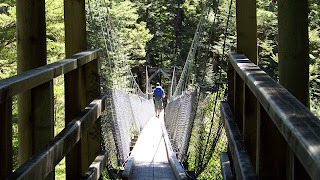 I crossed several swing bridges (always brings me back to a playground as a kid, somehow). Most of these span swift-moving streams. Waterfalls appear near the trailing about every 15 or 20 minutes of walking, it seems. About an hour into the walk, I started getting my first sweeping views of the mountainous landscape. 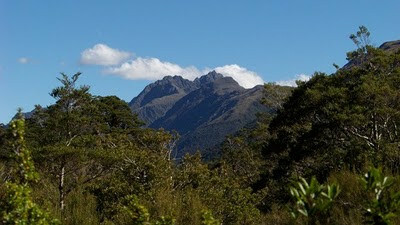 And another couple of hours later, I had arrived at Routeburn Flats. 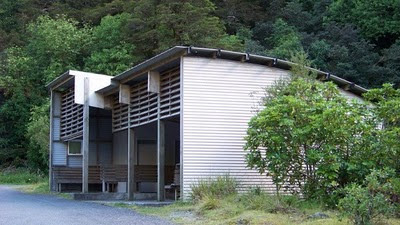 Here, there's a shelter at the bottom of a "burn", specifically, Routeburn, the namesake of the trail. I stopped for a bit, having a late lunch, brewing a tea in a borrowed pot, and filling (and treating) my water bottle from the stream. I also visited a bit and said my goodbyes to Matt and Stephanie, my mates from the bus ride from Queenstown. 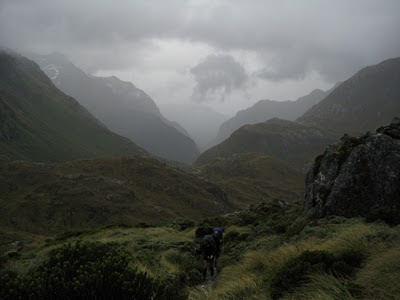 Having rested my feet a bit, I started the much steeper climb up to Routeburn Falls Hut. I was in no rush, having plenty of daylight and time to reach the hut. So I hiked comfortably, stopping to take lots of pictures, rewarded by some outstanding views of the burn below and the peaks above. I arrived at Routeburn Falls Hut a few hours before sunset, and managed to watch the mountains glow in a clear twilight. 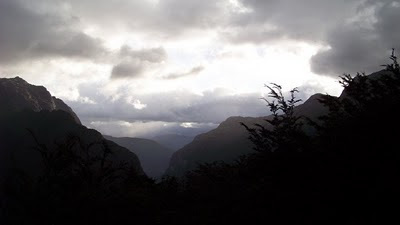 The views of the valley below, from the hut, were simply spectacular. The evening's ranger talk was fun and interesting, hearing a bit about the history of the trail and the wildlife. Our ranger left us with a challenge for the evening, which I found quite interesting! 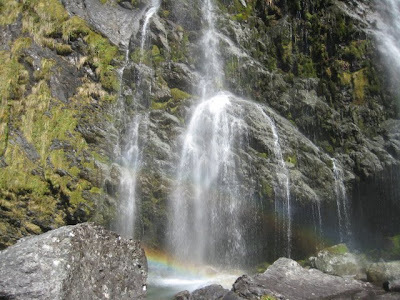 There was a huge canvas on one of the walls with "Welcome to Routeburn Falls, Merry Christmas) written in 30 languages. He offered a huge bar of chocolate to the first person or team to identify 25 of those languages correctly! Well, I had dinner with a young couple named Gary and Kylie, and Gary's mom -- all locals from New Zealand's southern island. And managed to team up with another couple (Nico from Italy and Rochel from Australia) for the language challenge. What a fun way to spend the evening! We managed to get 22 answers correct. Unfortunately, we mixed up Chinese/Japanese, and Norwegian/Swedish. We did manage to get a ton of them right, though. I recall having identified at least French, German, Dutch, Celtic, Spanish, Catylan, Italian, Romanian, Russian, Maori, Danish, Hebrew, Arabic, Korean. I know that we missed at least Slovenian, Ukranian, Punjabi. In any case, we didn't win the chocolate. But I did learn to play a card game called 500 (similar to Euchre, 42, Hearts, or Spades). Eventually, I called it a night, and turned in to my bunk. I didn't get a particularly good night of sleep, as it rained quite a bit. I had every intention of starting my hike by 7am, but it was raining pretty hard. 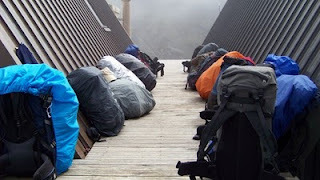 I pulled my sleeping bag over my head and tried to get a few more ZZZs. By 8am, I realized that the rain wasn't necessarily going to pass, and I had a solid 20km to cover. Time to don the rain gear. But first, coffee! So I started out a bit after 8:15am on Sunday morning. 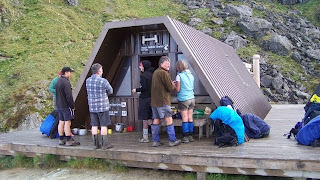 The hut was absolutely packed the previous night, with a huge group of 27 hikers in a commercial outfit. Unfortunately, the trail was rather packed with some 35+ hikers trying to cover the next few miles uphill at basically the same time. There was a lot of passing and being passed, on very narrow, very steep trails. Oh, and it was raining. Only occasionally a driving rain. But more regularly a misty, soaking rain. 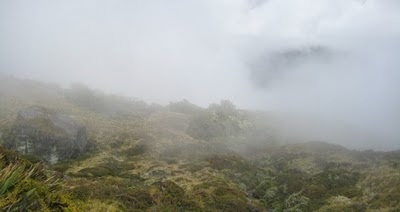 It was an uphill climb, gaining over 2000 feet of altitude, basically hiking into a wet cloud! Wet, crowded, cold, uphill hiking -- not exactly ideal conditions. But all that changed once I passed over 4000 feet, and stood above the rain clouds. The skies were clear, and the views of Lake Harris were simply spectacular. I took a few hundred pictures in the next hour, of Lake Harris and the dozens of snow covered peaks in every direction. The rain ceased, and I was able to peel off my rain gear and start drying off, now that I was basically above the clouds. Near the top of the saddle is another hut. Members of the big group were trickling into the hut where their organizers were boiling water for tea and hot chocolate. 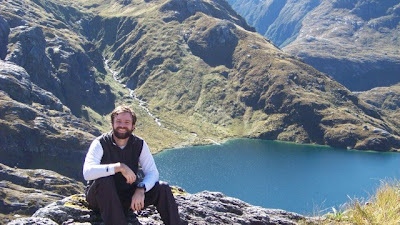 And spent the next 1-2 hours hiking to the summit of Conical Hill, where last night's ranger promised breathtaking views. About half way up, the views of Lake Harris were even more incredible. But once I got to the top, it was totally enshrouded in cloud. I literally couldn't see anything. I hung around for a good 15-30 minutes, waiting for the clouds to break, and they finally did, partially, and only for a few seconds. I could see a vast mountain range of gorgeous, snow capped peaks in the distance! 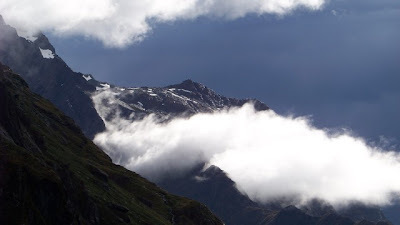 I could watch as clouds climbed over mountains and a seemingly accelerated pace. It was very beautiful. I have some nice video clips, too. Eventually, I made my way back down Conical Hill, grabbed my pack, and started a long traverse around the back side of the mountain. I took a few pictures, but unfortunately most of them were in a thick fog, an don't look very good. 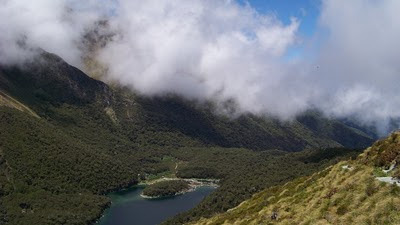 Eventually, I completed the traverse, rounding the side of the mountain, and was rewarded with views of Lake Mackenzie far, far below. 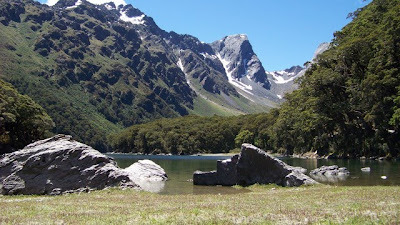 I could actually see the Lake Mackenzie Hut (my next stop) here, several miles away. But I was deceptively far away! It took nearly two hours to negotiate the steep, seemingly endless series of switchbacks down the hillside to the shores of the lake and the hut. My last 4 hours of hiking had been spent above the tree line, but now I was just making it back down below. 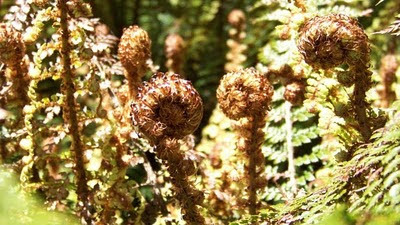 It's worth mentioning that New Zealand is the home to some 70+ species of fern, and the dense, lush rain forests are absolutely covered in them. So the Lake MacKenzie Hut was a sight for sore legs. It was quite sunny and warm, and I was really happy to stop for a good hour or so. 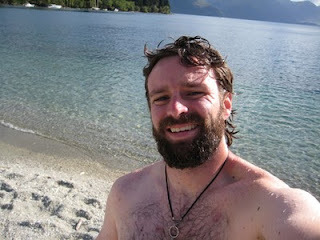 I took a dip in icy (8C, 46F) Lake Mackenzie, and then hung around for a bit on the beach, drying off in the warm sun. And after my nice respite, I set off for the end of my long day's hike. 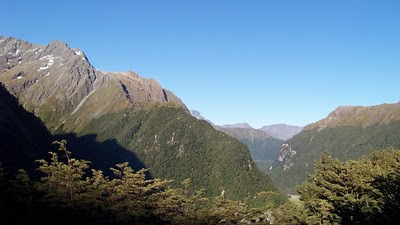 By this point, the skies had totally cleared, and the beautiful mountains of Fiordland National Park were in perfect view. 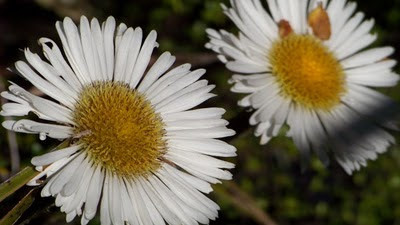 Mountain daisies covered both sides of the trail. And I got totally sun burnt! 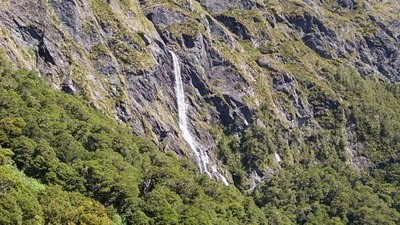 About half way to Lake Howden, I passed through the 174m (570 foot) Earland Falls. And while it was certainly amazing from a distance, it looked like a scene from The Blue Lagoon up close. 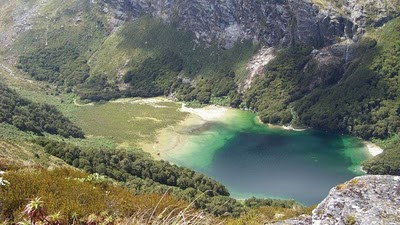 And about an hour later (and 20km after I started my journey earlier that morning), I finally arrived at Lake Howden Hut. Finally, I could get some rest, and reflect on how far I had hiked that day! 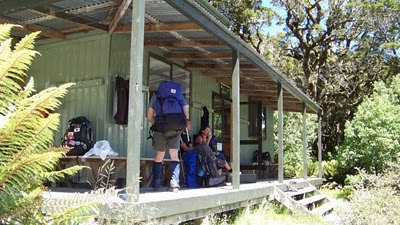 This hut was far less crowded than the previous nights' accommodation. There were only a few people, really. 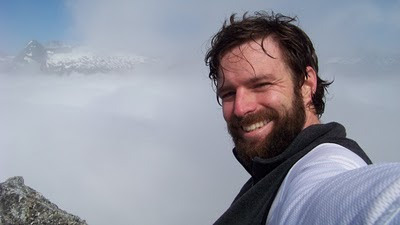 There was a really nice kid named Jonathan from Sydney (who, coincidentally had studied abroad at UT in Austin), traveling with his father who was an ultra-marathoner. But I really got a kick out of Carl, his sister Megan, and his girlfriend Sam, who were a lot of fun to chat with as the evening slipped away. So I munched on my dinner, finished my whisky, and got an excellent night's sleep. I woke early the next morning, as I had to finish my hike and board a bus by a whopping 10:15am! 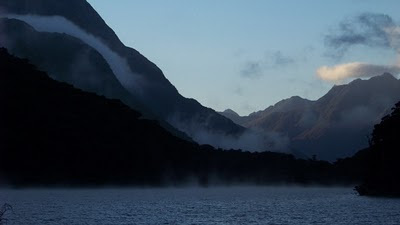 The fog rolled slowly over Lake Howden that morning. The beginning of the morning's hike was actually quite steep! But once I made it to the crest, I could see all of the valley below, all the way down the burn, to mountains many, many miles in the distance. 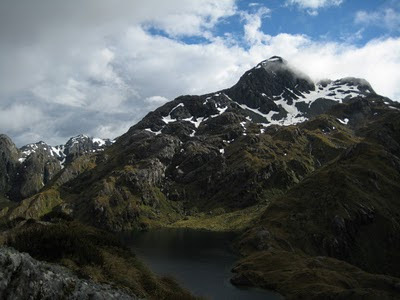 After a few more waterfalls, and a nice traipse down a fern-filled trail, I had completed the Routeburn Trek! I hung around the Divide Shelter for the next hour or so, awaiting my bus. With some strange patterns inside. They look like something from Avatar :-) Can anyone help me identify this plant? And alas, my bus arrived, perfectly on time. I dozed off for a bit of the 5 hour drive back to Queenstown, but I can guarantee that the scenery was spectacular. I was just exhausted! 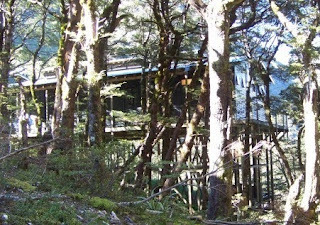 To close the trip, I had one relaxing day and night in Queenstown, where I stayed at the rather fancy Nomads Hostel. This place is in a totally different league from the hostels I stayed at nearly 10 years ago backpacking around Europe in 2001. 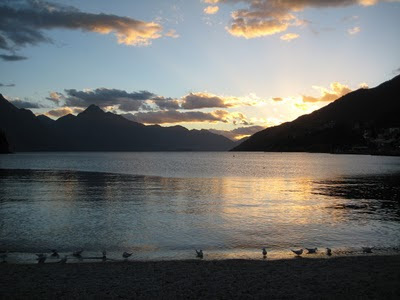 The town is right on Lake Wakatipu, with a nice, clean beach. 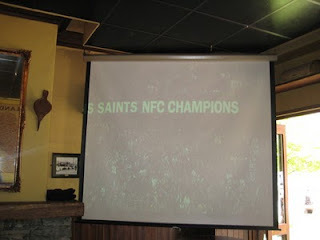 I actually watched the end of the NFL playoff game where Drew Brees and the New Orleans Saints beat Brett Favre and the Minnesota Vikings in overtime in a rocking Superdome. Who dat! After I finished my fish-n-chips and a Guinness, I took a very cold dip in the lake, brrr! I wandered around Queenstown for a bit, buying a few souvenirs, enjoying an ice cream, and passed back by the beach around sunset. I finished my trip with a blind pub crawl organized by the Nomads Hostel, which was surprisingly fun! And that's about it. What a trip! I hope you enjoyed my narrative and pictures. I certainly enjoyed recapping it. The flowers are lupins. 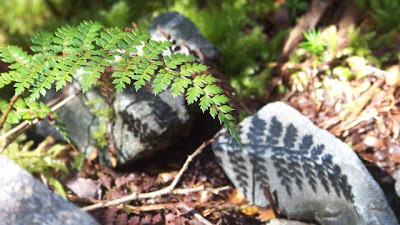 You'll see the same plants in the Harry potter movies, not avatar. Found your post via planet ubuntu. Sounds like a fun trip! 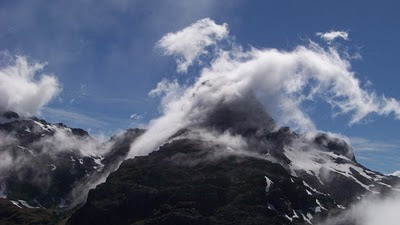 Those pictures of the clouds rolling through the mountains are absolutely breathtaking. This flower seems to be a "Digitalis pupurea". 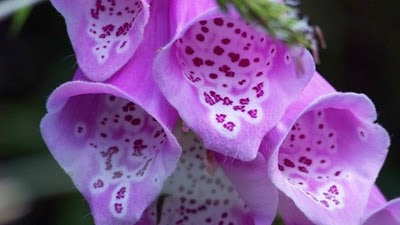 There are quite much of them here in Belgium, they are called "digitales" in French. It's a word that is different from the english "digital" word, it means "relative to fingers". It's called like that because of the shape of the flower: you can put your finger in it. Nice write up. Glad you enjoyed visiting NZ. 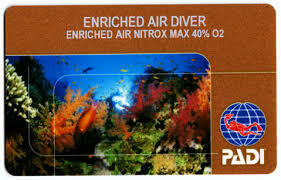 Dustin, it's really quite refreshing to read about non-geek related activities. 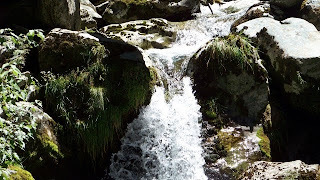 I really enjoyed reading about your trek, and the marvelous pictures. One day I would like to do that route. The purple flower looks like foxglove to me. 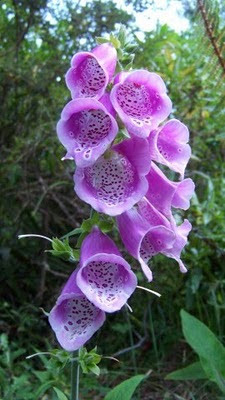 The plant is the common foxglove - digitalis purpurea. It is common in the UK and is also found in the US, I believe. The entire plant is toxic (including the roots and seeds) and is on the USDA Noxious Weed List. What an awesome hike! 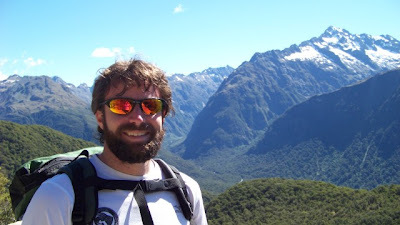 My wife and I visited Auckland a few years back, but we mostly stayed in urban areas and never got much time out in New Zealand's wilderness. This post makes me want to get down to the South Island and see those mountains. Times like this I'm particularly proud to live here (Wellington). Glad you enjoyed it! 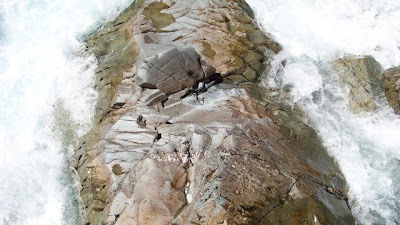 Well done for being brave enough to go swimming in the South Island. Tons of great pics, great post. 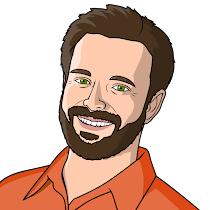 Server Bug Zapping Call for Participation! Have you taken Lucid for a testdrive yet? 2010 Austin Marathon - I'm Running Ubuntu!